Scanning Kelvin probe microscopy (SKPM) is a tool used to measure work function and local electrical potential distribution of various materials with nanoscale features. The most common application of this technique is the study of electronic properties of semiconductor nanostructures and surfaces. Potential profiling of such materials composed of negatively or positively changes are some of the measurements that can be done using this technique at nanoscale lateral resolution. Implementation of such technique to unveiling the variation of charge distribution that occurs on the nanoscale helps to better understand and improve the performance of CMOS semiconductor devices. [1-2] The SKPM has also been instrumental in characterizing and determining the quantitative physical information such as the total charge and charge position of polymer materials. [3, 4] There are other surface potential or work function measuring tools that have been introduced, such as electron beam induced current (EBIC), scanning electron microscopy (SEM), and photoelectron spectroscopy (PES). However, some of these techniques are only applicable for inorganic types of semiconductor samples, some are destructive and require high vacuum, while others don’t provide high enough spatial resolution. Compared to other techniques, SKPM is a nondestructive and air-ambient compatible technique, which is undoubtedly one of the easiest to use electrical failure analysis and nano metrology tool available in the market today. Conventional SKPM technique (also known as Amplitude Modulation AM-SKPM) has already made remarkable contribution in maintaining device reliability and analysis of advance materials compared to other measurement techniques. However, there is room for improvement in the signal to noise detection ability of AM-SKPM technique such that even the features having less optimal surface potential strength can be detected and mapped out with higher lateral resolution and accuracy. Toward this end, recently, Park Systems has developed a technique called Frequency Modulation FM-SKPM with Atomic Force Microscope (AFM). This technique is useful for electrical characterization allowing measurements with better sensitivity compared to AM-SKPM. In this study, a polymer material is measured to compare the performance of AM-SKPM to FM-SKPM. The results acquired in the experiment show that FM-SKPM is significantly more sensitive compared to AM-SKPM in measuring both work function and surface potential distribution of different materials. 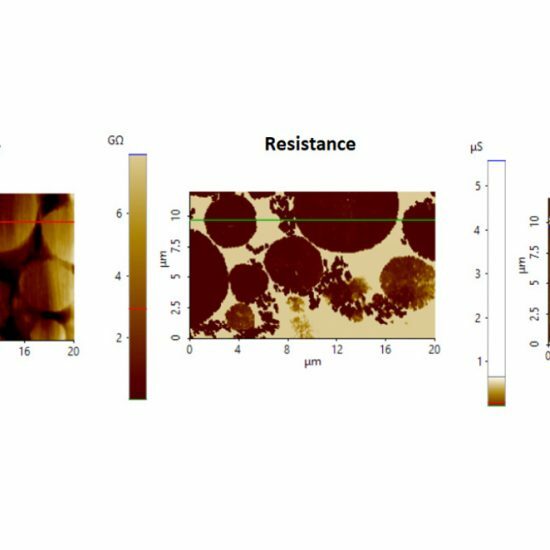 A polymer patterned array material deposited on Silicon substrate was analyzed using a Park NX10 AFM. Two separate scans were conducted to acquire AM-SKPM and FM-SKPM measurements. The scan parameters and the tip used in acquiring images were all the same. A conductive Mikromasch NSC36Cr-Au cantilever (nominal spring constant k = 1 N/m with resonant frequency f = 90 kHz) was used in the experiment. In SKPM mode, there are two interaction forces between the AC biased tip and the sample: the electrostatic force and the Van der Waals force. The Van der Waals force is harnessed to generate the sample’s surface topography while the electrostatic force between the tip and sample generates data for the sample’s electrical properties. The obtained cantilever deflection signal contains both sets of information; therefore, a method that can completely separate these signals is the key to successful imaging. In Park NX10, lock-in amplifiers embedded to its electronics are used to separate the signals. This allows for the acquisition of both topography and EFM data simultaneously. Two amplifiers are used by the system, named lock-in 1 and lock-in 2. Lock-in 1 obtains the topography information by analyzing the tip motion caused by the Van der Waals interaction, while lock-in 2 obtains electrical property information by analyzing the frequency of the applied AC voltage signal to the tip which, in turn, generates an electrostatic force interaction with the sample. The frequency of the applied AC voltage signal is chosen to be smaller (5 – 20 kHz) than the cantilever oscillation frequency (70- 330 kHz), enough so that the two signals do not interfere each other. In FM-SKPM setup , the NCM phase signal of Lock-in 1 is transferred to Lock-in 2 to serve as a source for EFM operation by connecting BNC cable between ‘Aux2 out’ and ‘Aux1 in’ shown in Figure 1. Furthermore, a separate DC bias was applied to the cantilever and controlled to create a feedback loop that would zero out the electrical oscillation between the tip and the sample caused by the application of an AC bias to the cantilever. 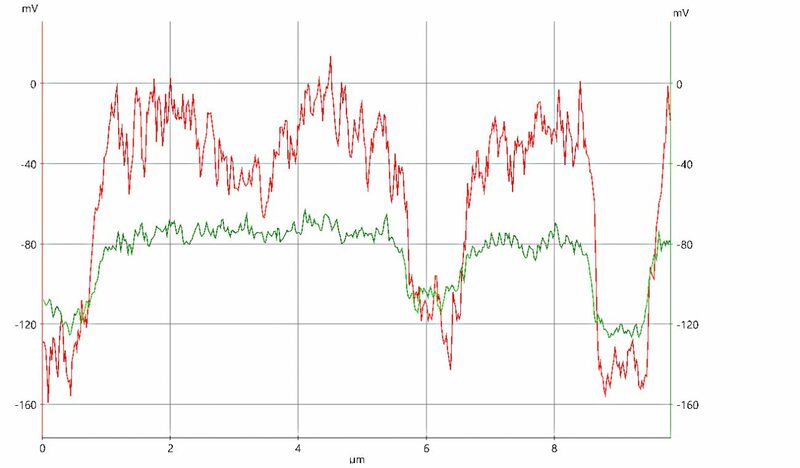 The value of this offset DC bias that zeroes out the AC bias-induced electrical oscillation is considered to be a measure of surface potential. Figure 2. 10 µm x10 µm image of polymer patterned array. Topography image (left), FM-SKPM image (center), and AM-SKPM image (right). The topography data obtained in this experiment show that polymer patterned array with square-like features were successfully deposited on silicon substrate, but showed no significant information related to its surface potential. In contrast, the surface potential data acquired in AM-SKPM and FM-SKPM show the surface potential structure, but shows no significant information related to physical structure of the sample. The domain structure shape observed in SKPM data of the sample was similar to the physical structure observed in topography data, which was a patterned array consisting of square dots. The data acquired in this experiment were all analyzed using Park XEI software. Figure 2 shows the topography (left), FM-SKPM (center), and AM-SKPM (right) images of the polymer patterned array sample. The topography data can be acquired simultaneously with the SKPM data. In Figure 2, the topography image presented was acquired simultaneously with the AM-SKPM image. The topography shows a clear image of a well-defined lattice structure. The Park XEI software maps the acquired signals into a color table. In the topography image, the square-like features that appear to have a brighter color represent the areas with higher height while the flat surface with darker color represent the areas with lower height. The measured peak to valley in the topography image was approximately 150 nm. On the other hand, both AM-SKPM and FM-SKPM data show a patterned array with an irregularity on the surface (pointed by red arrows). In the two SKPM images, the square-like features that appear to have a darker color, represent the areas with relatively lower surface potential while the flat surface with brighter color represent the areas with higher surface potential. By comparing the surface potential results acquired from AM-SKPM and FM-SKPM, one can easily determine that FM-SKPM has better sensitivity in detecting surface potential variation compared to AM-SKPM. In this experiment, FM-SKPM technique provided a higher resolution image that shows sharper edges of the square features compared to AM-SKPM. In addition, FM-SKPM was able to detect weak potential in the irregular surface while AM-SKPM was not able to detect any potential variation. The line profile that was generated by the XEI software in Figure 3 (bottom) provides the potential information of the polymer patterned array. The line profile for the FM-SKPM is indicated in color red while the line profile for AM-SKPM is indicated in color green. The line profile of the FM-SKPM image clearly shows that there is a slight change in potential (encircled in red) in the irregular surface compared to the areas next to it. On the other, the line profile of AM-SKPM doesn’t show any changes of potential in that surface. By comparing the line profile of the two techniques, it can be concluded that FM-SKPM is at least an order of magnitude more sensitive than the conventional SKPM technique also known as AM-SKPM. Figure 3. FM-SKPM image (top-left), AM-SKPM image (top-right) and corresponding line profile (bottom) acquired from the polymer sample. FM-SKPM line profile (red line, y-axis on left) and AM-SKPM line profile (green, y-axis on right). 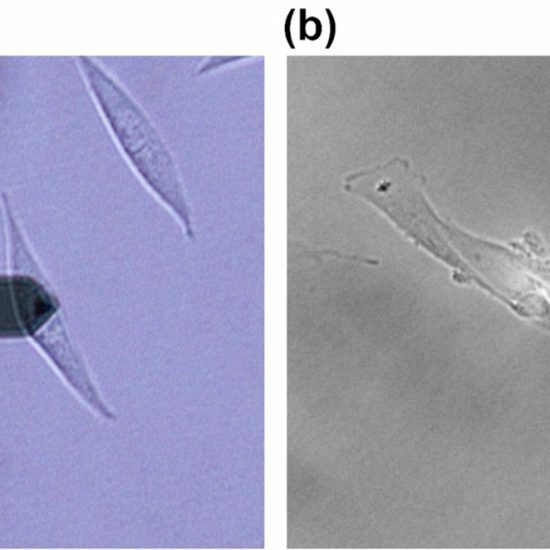 The polymer patterned array was successfully characterized using both the conventional method of SKPM (AM-SKPM) and FM-SKPM imaging on Park NX10. The topography data reveals that the sample surface is composed of patterned array with square-like features. 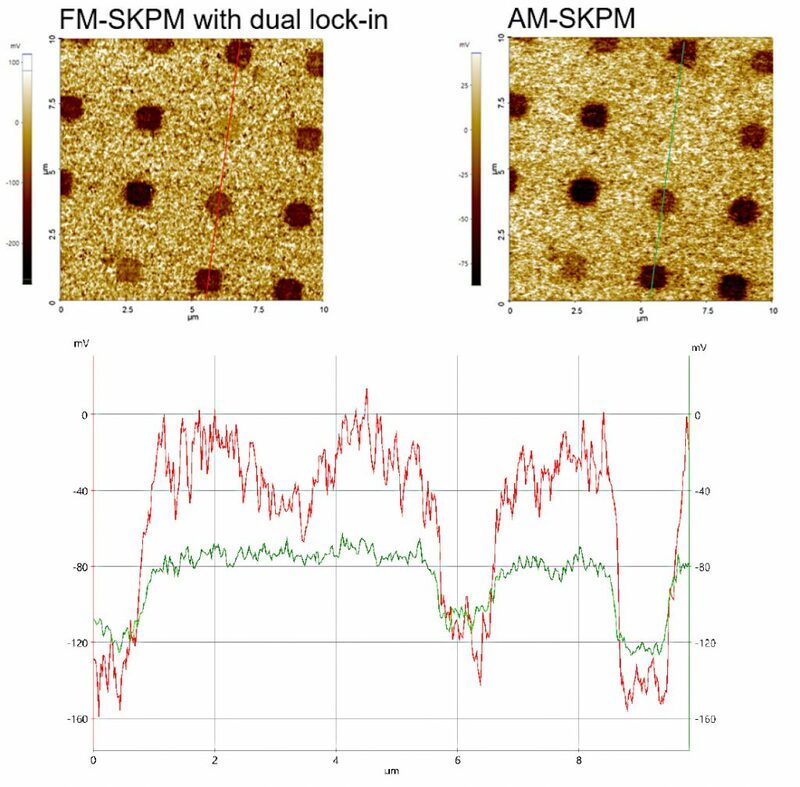 Irregularity in the patterned array is observed on both AM-SKPM and FM-SKPM images. However, while FM-SKPM technique shows that the irregularity in the surface pattern is a surface with weak potential, the AM-SKPM was not sensitive enough to detect the weak potential in the same region. From the above results, it can be observed that FM-SKPM is an order of magnitude more sensitive compared to AM-SKPM and it is more useful in detecting surface potential variations. 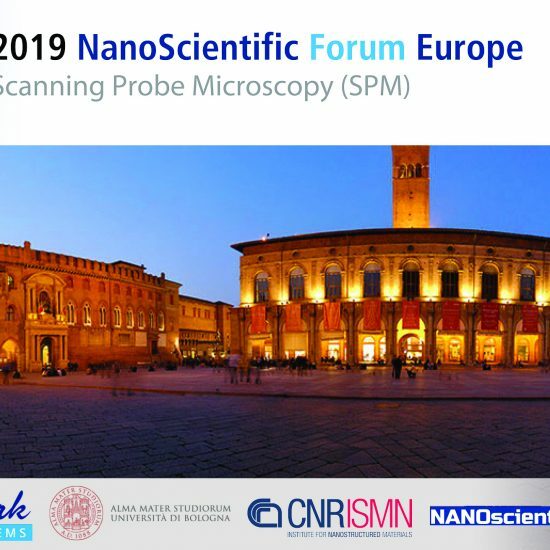 Furthermore, the increased sensitivity of FM-SKPM increases the chance of detecting defects with better resolution and accuracy in semiconductor devices and other advanced materials. 1. 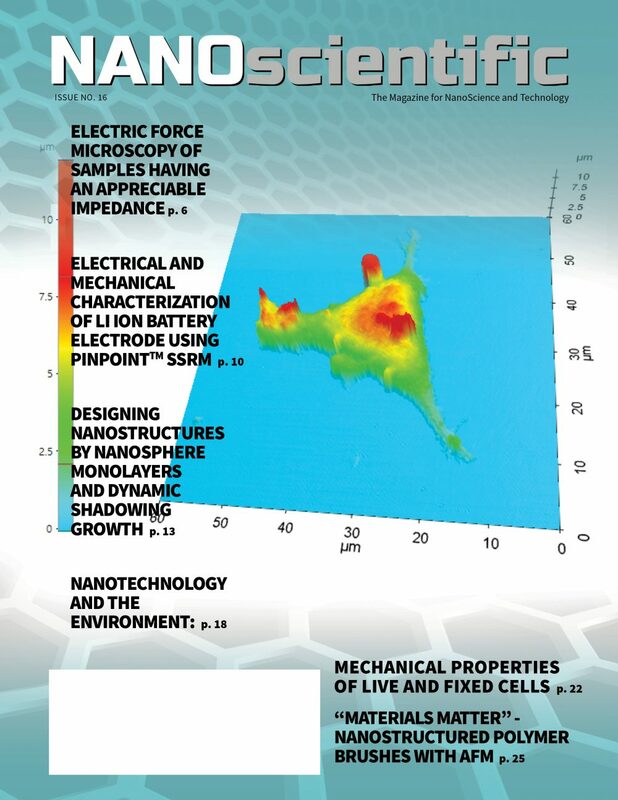 Lan Fei (2018) FUNDAMENTALS OF KELVIN PROBE FORCE MICROSCOPY AND ITS APPLICATIONS IN THE CHARACTERIZATION OF SOLAR CELLS. Doctoral Dissertation, University of Pittsburgh. 2. 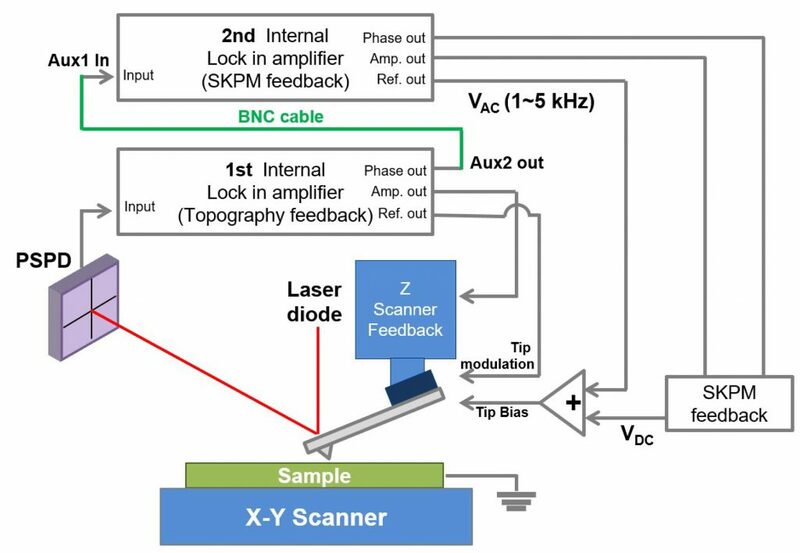 J. Pineda, et al., Electrical Characterization of Semiconductor Device Using SCM and KPFM Imaging. 3. J. Gonzalez, et al., Charge distribution from SKPM images, PCCP, Issue 40, 2017. 4. M. Ortuño, et al., Conducting polymers as electron glasses: surface charge domains and slow relaxation, Scientific Reports volume 6, Article number: 21647 (2016). 5. W. Melitz, et al., Kelvin probe force microscopy and its application, Surface Science Reports 66 (2011) 1–27.